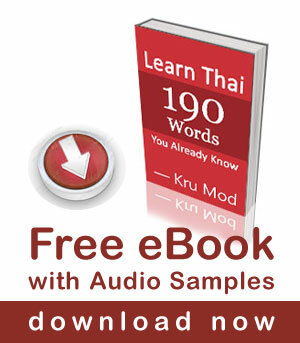 The basic word that is used when you place an order in Thai is เอา /ao/. Some people say the word ขอ /kŏr/ is more polite to use when ordering food, but I don’t think it matters. Important note: As the fact that we use เอา /ao/ to place order, so it can ONLY be followed by a noun or noun phrase. Read more about the right way to use เอา here. Waitress: เอาน้ำอะไรคะ /ao náam à-rai ká/ What would you like to drink? *Thai people ask this question with the structure: ‘you would like to have what drink?’ The word น้ำ/ náam/ literally means ‘water‘, but we also use to refer to ‘drinks’ in general as well. Male customer: เอาน้ำมะพร้าวครับ /ao náam má-práao kráp/ I would like to have coconut juice. Waitress: เอาน้ำแข็งมั้ยคะ /ao náam-kăeng mái ká/ Would you like ice? Male customer: ไม่เอาครับ /mâi ao kráp/ I don’t want it. From the short conversation above, the word ‘เอา ao‘ is used to place an order as well as ask for order by the waitress. Sometimes the waiter uses more formal word with the customer when asking for the food order which is the word รับ / ráp/. It has the same meaning as เอา /ao/ , but just more formal. There is no right or wrong which word to use. Personally, I like to say เก็บตังค์ /gèp dtang/. When you want to make a request for something (I usually say that ‘requesting for something you don’t need to pay for’) the word ขอ /kŏr/ is used. ขอ kŏr + something + หน่อย nòi + ได้มั้ย dâai-mái? ขอมีดหน่อยได้มั้ย /kŏr mîid nòi dâi-mái?/ Can I have a knife please? ขอแก้วเปล่าหน่อยได้มั้ย /kŏr gâew bplàao nòi dâi-mái?/ Can I have an empty glass please? **Note: The word หน่อย /nòi/ is added for an extra politeness in your request. ขอ kŏr + something + ได้มั้ย dâai-mái? 1. Can I have your phone number please? kŏr ber too-rá-sàp kŏrng kun nòi dâai-mái? 2. Can I have wifi password? 3. Can I have chopsticks please? I have seen in a video a-nee a-roi, I am sure it was a way of saying the food was delicious, but when I see either word used in other sentences it doesnt seem to match up (i.e. google translate). The sentence you are talking about is อันนี้อร่อย /an-níi à-ròi/ which is this one is delicious. อันนี้ an-níi means “this one”, อร่อย à-ròi means “delicious”. อันนี้ไม่ใช่ของเรา an-níi mâi-châi kăwng rao = this one is not ours. What is the waiter saying in the first line of the skit? I heard “Rap arai dee kha?”. I know that the rap is just another word for ao, arai is what, but what is the dee in this context? Thanks! – Where shall we go? bpai năi dii? – What shall we eat? gin à-rai dii? The server often add ‘dii’ after this question to ask for a suggestion from the customer what id good for them to order. It also makes the question sounds friendly as well. The pattern “do something + ได้ dâai” is used to describe that you can do something. For example; káo gin pêd dâai = She can eat spicy food. Can i use this word instead for the phone number? kor ber khong khun dai mai? well done, useful lesson khop khun krap mod. the video not work ! Kep tang maï khrap’.kopkun khrap! .Easy .. No?